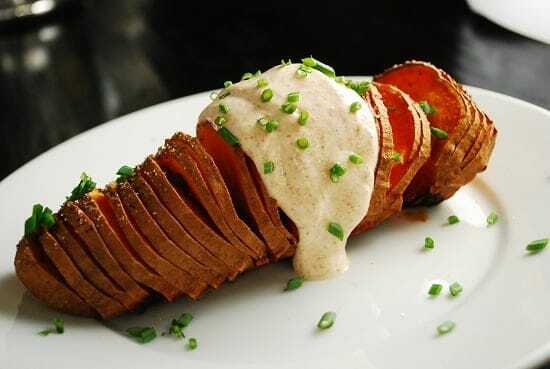 This Sliced Sweet Potatoes with Chipotle Yogurt Sauce offers a great new and delicious way to prepare a baked potato. Using a sweet potato and then topping it with a fabulous spicy Chipotle Yogurt Sauce makes it such a flavorful dish that is quite filling at just 4 Points per serving. Slicing the potato almost all the way through helps to cook the potato a bit faster and it just looks neat. Also, it creates additional crevices for the yummy sauce to go into! It’s a pretty quick and easy Weight Watchers Potato Recipe that can go with a variety of meals. I had this for lunch with a salad and cup of soup…perfect! If you loved baked potatoes, but are getting tired of preparing the same old traditional baked potato recipe, then try out these guilt free Sliced Sweet Potatoes with Chipotle Yogurt Sauce instead. These delightfully simple, thinly Sliced Sweet Potatoes with Chipotle Yogurt Sauce put a deliciously unique twist on the classic baked potato recipe. Flavorful and filling, this baked sweet potato recipe offers a great way to feel full without using up a lot of Weight Watchers Points. Thinly slice each potato almost all the way through. Lightly mist with olive oil mister, and sprinkle generously with salt and pepper. Put in the oven and bake for about 40 – 45 minutes. While potato is cooking, mix yogurt with chipotle seasoning. Remove potatoes from oven and let cool for about 5 minutes. Top each potato with ½ of the yogurt sauce. Garnish with fresh chives. Serve immediately.